For more information, an interactive map, full itinerary and contact info for registration, visit our France webpage here. To talk to a real person, contact Kendall at kripley@ctscentral.net or ‭(866) 468-1420‬. Fr. Dan Good will be our chaplain. We will visit the most amazing churches soaring into the sky as a testimony of the faith of the French people in earlier generations. Saints and Doctors of the Church will instruct us along the way. 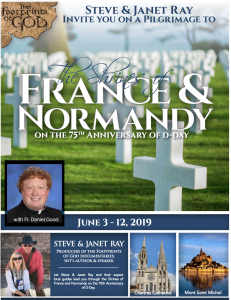 From June to August 2019, all attention will be on the D-Day landing beaches and the numerous sites of the Battle of Normandy which led to France liberation. The 75th anniversary of the D-Day landing and the battle of Normandy will be commemorated by many Allied Heads of State and thousands of visitors from all over the world. 2019 will be the scene of a large number of commemorations including festivities with firework displays, parades, parachute drops, setting up of military camps, open-air concerts with big bands playing. Why not go back in time and revisit the main sites of 6th June 1944 or take a virtual tour of the key places in the Battle of Normandy? 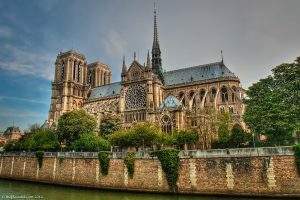 Our guide–tour leader has a great knowledge of the places you’ll visit and a deep knowledge of the history of France, of its Christian heritage, of the spirituality of the sanctuaries and the monasteries. The role of our guide is to give us give spiritual, cultural and historical explanations throughout France. However, in some Unesco or national monuments sites, only local guides are authorized to guide. In these specific cases, it’ll be mentioned in your program. “Steve, You are the Man! What an itinerary! All that and Fr. Dan! Can’t believe we will be at D-Day on 6/6. Contacted Corporate Travel Service already. We are registered and ready to go. Depart on overnight flights to Paris, France. Arrive at the Paris Airport and meet Steve & Janet Ray and your local French tour manager in the Arrivals Hall. 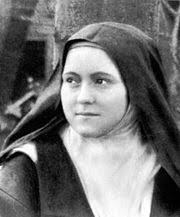 Board your private motor coach for transfer to Lisieux, home of St. Therese, the “Little Flower”. Tour of the Basilica. Time for lunch on your own. Visit the “Buissonnets”, the family home where St. Therese spent her childhood and see the Carmelite convent where she lived until her death. 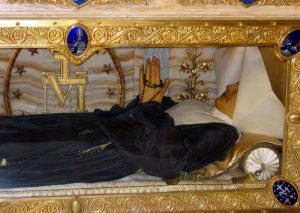 Have time for prayer by her relics at her shrine. Visit the Cathedral of St. Peter where the Martin family went regularly for Mass. Celebrate Mass. Transfer to Pont-Audemer and check in to your hotel. Celebratory welcome dinner and overnight in Pont-Audemer. Breakfast at your hotel. Transfer to Caen and visit the memorial of the landing. Celebrate Mass. After lunch on your own, visit Bénouville’s bridge, best known as Pegasus bridge, then go to Arromanches where you’ll see the maritime vestiges of the greatest artificial port ever created. All the armored vehicles, trucks, supplies and men came into France through this port. 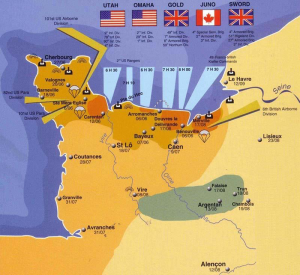 Discover Omaha beach, the most famous of the Normandy landing beaches. Visit the American cemetery at Colleville-sur-Mer and pay your respects to the soldiers buried there. Return to Pont-Audemer for dinner and overnight. Breakfast at your hotel and early departure this morning. Attend the festivities planned for the commemoration of the 75 th anniversary of the D-Day Landing. The official program will be confirmed closer to the date. Lunch as a group in a local restaurant. The official program continues this afternoon. Return to your hotel for dinner and overnight in Pont-Audemer. Breakfast at your hotel. 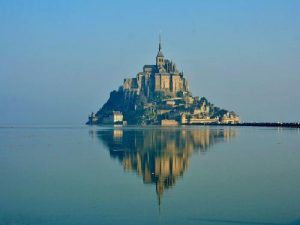 Check out of your hotel and depart for Le Mont-Saint-Michel. Stroll through the charming village with stone houses and narrow streets, built on a rock off the coast of Normandy surrounded by one of the world’s largest bays. The village and the bay are listed as a UNESCO World Heritage Site. Visit the Abbey of MontSaint-Michel. Lunch on your own and afternoon in Le Mont-Saint-Michel. Celebrate Mass. Depart for Le Tronchet and check in to your hotel for dinner as a group and overnight. Breakfast at your hotel. 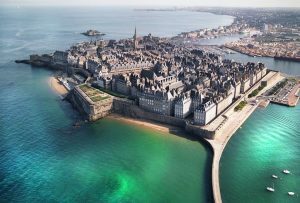 Transfer to Saint-Malo, on the coast of the English Channel. With the discovery of the Americas and development of commerce with India, Saint-Malo became an emboldened economic center. Ship owners with their accumulated wealth built beautiful homes called “malouinières” which are today one of the unique features of this maritime town. Visit the Cathedral of Saint Vincent, the beautiful Gothic church located in the heart of town. Lunch on your own. Transfer to Pontmain, at the border of Normandy and Brittany. Visit of the Sanctuary of Pontmain where the Virgin Mary appeared to four children in 1871, amid a Prussian invasion. Today the magnificent basilica welcomes pilgrims coming from all over the world. Discover the parish church, the barn where the villagers came for the apparition, and the museum. Celebrate Mass. Return to your hotel in Le Tronchet for dinner and overnight. 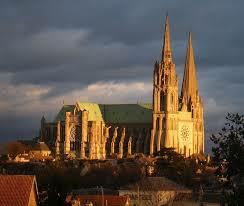 Have breakfast at your hotel, then check out and depart for Chartres. 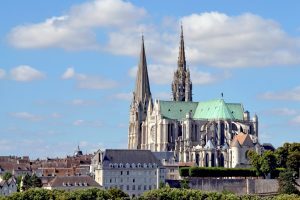 Visit the majestic Cathedral of Chartres, the elegant architecture is a symbol of Christianity and French history. The cathedral is also famous for its annual student pilgrimage – every year at Pentecost, about 15,000 students walk 3 days from Paris to Chartres. Celebrate Mass. Lunch on your own. Continue to Paris and take a panoramic motor coach tour of the city for a first look at most of the capital city’s monuments. Check in to your hotel. Dinner on your own. Overnight in Paris. After breakfast at your hotel this morning, visit the cathedral of Notre-Dame de Paris, a jewel of gothic art. Visit Sainte Chapelle, a treasure in the center of Paris, built as a reliquary for the holy relics of the Crown of Thorns, acquired by King Louis IX (now located in Notre-Dame). Discover the lower part with its openwork design and its bright colors and the upper part flooded with light with huge stained-glass windows. Visit the Chapel of the Miraculous Medal, where the Blessed Mother appeared to Saint Catherine Labouré. Pray at the site of the apparitions or in front of St Catherine’s incorrupt body. Celebrate Mass. Just a few blocks away, visit the Chapel of St. Vincent de Paul, and his incorrupt body. Time for lunch on your own. See the Basilica of Sacre-Couer in Montmartre, where perpetual adoration of the Blessed Sacrament has continued uninterrupted since 1885. Time to pray in adoration. Dinner on your own. Overnight in Paris. Breakfast at your hotel. Celebrate Mass. 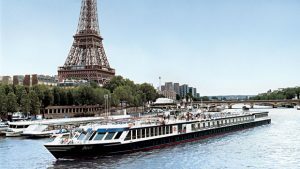 Board the famous Parisian “bateaux-mouches” for a scenic river cruise where you will view all the most beautiful sites of Paris from the River Seine! Lunch on your own and afternoon at leisure to explore or shop in the City of Light. Celebratory farewell dinner at a local restaurant. Overnight in Paris. Bid “au revoir” to France today. Check out of your hotel and transfer to the Paris airport for return flights home.